To supplement my chronic travel itch, I do look for ways to earn extra income. Travel, especially one that involves flying overseas, can be quite expensive. But unless I win the lottery, it looks like I'll be stuck with doing overtime work which sadly is killing my social life. Here comes my brother-in-law. He sells stuff: hard-to-find collector's item that he snags from anywhere and sells them online through eBay. And when I saw that he indeed gets paid in return, this got me curious and I thought "why not?". eBay has been around for years but it's only now that I truly got interested. In my closet were at least two things I don't use anymore, things that perhaps might generate me extra buck to help me go somewhere. I took the items out, cleaned them like a baby, and took pictures of them. My hope is that someone in America is looking for these exact things. To start the selling/auction process, I had to register with eBay. Their beginner's video tutorials were so helpful that I was excited to list my items that very same day on March 13. First to go on sale was an Ipod Classic 5th Generation that I bought some years ago. It's gone with me on several journeys - now its fate lies on a path to different ownership. When I bought a new DSLR, it came with a free Lowepro Fastpack 250 backpack which I really didn't need (despite being such a great product itself). I began to imagine other photo enthusiasts out there lurking on eBay searching for this bag so this camera accessory is definitely getting a new home. Lastly, my Lumix DMC FP1 point-and-shoot camera was put up for sale since my need for it has really waned. This was my 'spy camera' that I used for discreet photos of people (no protruding lens!). So someone looking for a small, back-up camera will find this Panasonic gadget really useful, now at a very discounted price. Selling on eBay of course means fees for the seller. Posting a photo - a very important part of advertisement - is free but each additional photo will cost 15 cents. Depending on the kind of selling format (auction-style, fixed price, etc), this involves an insertion fee (for listing an item which in my case was 75 cents each) and final value fee (which is 9% of sale price). All the items I listed for auction had a starting bid price of $49.99 (a price I'd be happy to settle with should there be only one bidder). After three days, two of the items got sold - the old Ipod for $78.39 while the brand new bag stayed at $49.99. The camera had a longer auction run for five days, giving me an extra $51.11. In the end, my first foray into eBay generated a total sum of $179.49. 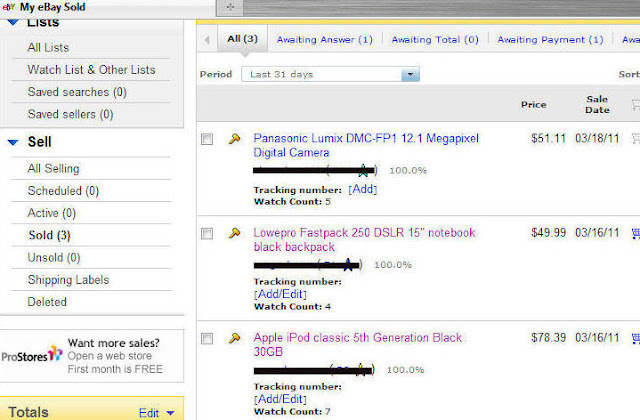 Since Paypal has been fully integrated into eBay, this is now the preferred method of payment for buyers and sellers. There is a transaction fee (2.9% + 30 cents) for receiving payments but I like that it has the added layer of security against fraud. As a first time seller, my payment was even placed on hold until shipments were made, tracked and received by the buyers. Would I sell again on eBay? You bet. Hopefully the next one would help cover the cost of an airfare. For a time I sold some books and stuff on ebay. But it is very hard to do some serious money on ebay unless you have enough items in your house you want to sell. You also spend a lot of time packing and sending of stuff. That's an idea worth exploring. I haven't really given this channel a thought, but I know some people really "make" money out of extra stuff they have. That's true. But as time moves on, I'm surely going to amass more stuff, specially digital ones, that gets obsolete once a new model comes out. It's really a great way to dispose of things that otherwise would just gather dust. And I couldn't believe what others sell - one was a set of Armani shopping bags! Hilarious. Di naman. As you can see, nabenta pa rin and someone else is now enjoying it. i still have to dig my memory if i have done online transactions in the past other than purchasing airfare tickets. i don't even know how ebay works! haha... i do have paypal account but i prefer bank transfers or couriers. honestly, before reading your post and by just merely looking at your photos, i thought you're giving them away as blog contest prizes. wishful thinking me. haha! oh wow! 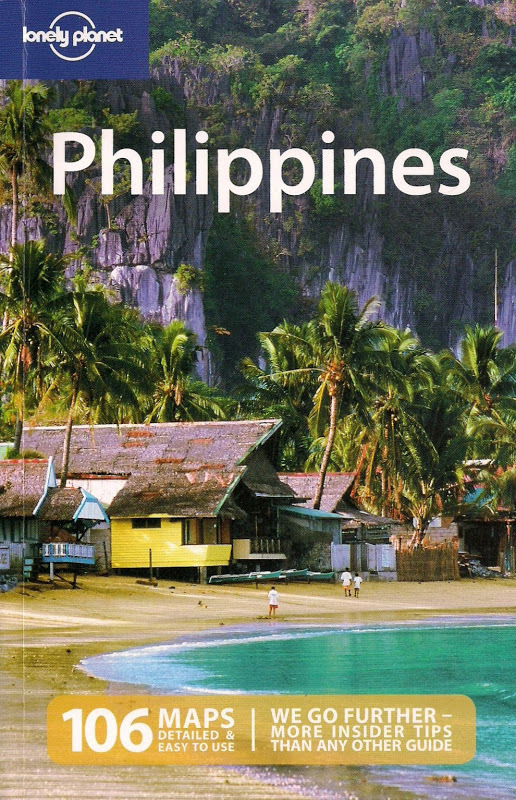 i tried selling one of my lonely planet book there but nobody bought it. i gave it instead. hahaha... but yes i believe one can really sell online. I had to go through their video tutorial in order to learn the basics and start selling. but you got me thinking now about throwing a blog contest! let's see. funny how you had to end up giving it. but that's how it works, either someone will buy it or no one will. at least you tried. LOL!!! you definitely can't be cheap. like wine, the older you get, the finer & more expensive you can become. hahaha!